This is a great meatless burger option. 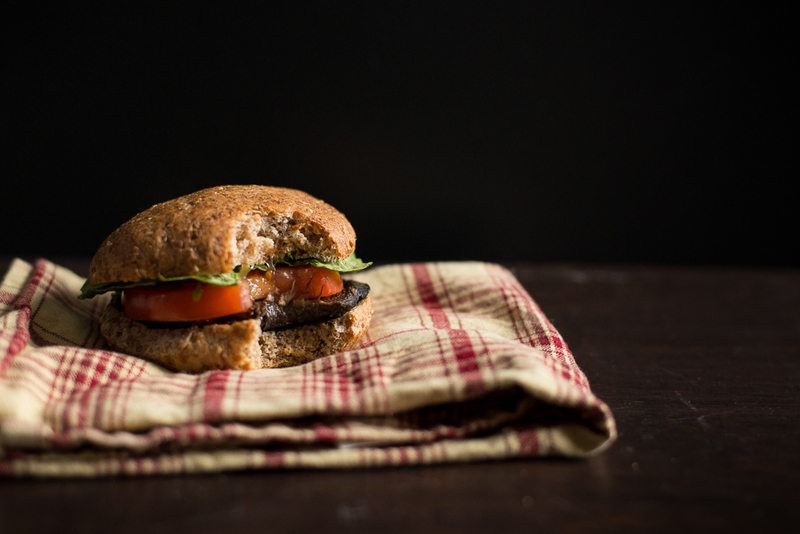 Portobello mushrooms have a great meaty texure and are the perfect size for grilling and serving on a hamburger bun, pita bread or even on top of a salad. Once in a while you can trade a traditional meat patty for the lean protein, fiber, vitamins, minerals and antioxidants of a big old mushroom. Dress it up like burger with all the fixings and you may forget what you are missing! Worcestershire sauce contains anchovies (fish). For a vegan/vegetarian version or to avoid fish because of an allergy, substitute a vegan Worcestershire sauce, like the one made by Annie's. Wipe mushrooms off and remove stems. Whisk together remaining ingredients in a shallow pan or casserole dish. Place mushrooms in the mixture with smooth side down and gills up. Spoon marinate into gills so that they are saturated. Marinate about 10 minutes, and spoon additional marinade into the gills. Marinate another 5-10 minutes. Heat grill to medium heat. If your pan is smaller and mushrooms don’t all fit, rotate so that the ones on the top are resting on the bottom. Grill on medium heat for about 6-8 minutes per side until mushroom is cooked through. Serve on your favorite bread, wrap or salad.